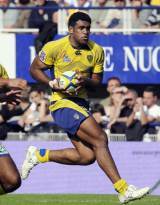 Napolioni Nalaga signed for Clermont Auvergne ahead of the 2007-08 season after impressing at both age grade and Sevens level for Fiji. The giant winger caught the eye of legendary Fiji Sevens skipper Waisale Serevi after some stirring performcances for Nadroga and Fiji at Under-19 and Under-21 levels, playing on the IRB Sevens tour. After his move to France, Nalaga was Clermont's top scorer in his first season with the club. He was a member of the 2008 Pacific Islands touring team, but will be best remembered for horrific high-tackle on France scrum-half Jean Baptiste Elissalde. His Clermont career ended in 2011 due to personal problems in Fiji, but Nalaga won an international call-up for the Pacific Nations Cup, scoring twice against Japan before winning a start against the All Blacks in Dunedin.